It’s the most wonderful time of the year, the year-end bonus season. Remember to treat yourself for a good job done throughout the year. You deserve to be spoiled and enjoy more life treasure with a Full HD multimedia monitor to catch you on your favorite show or improve your work. 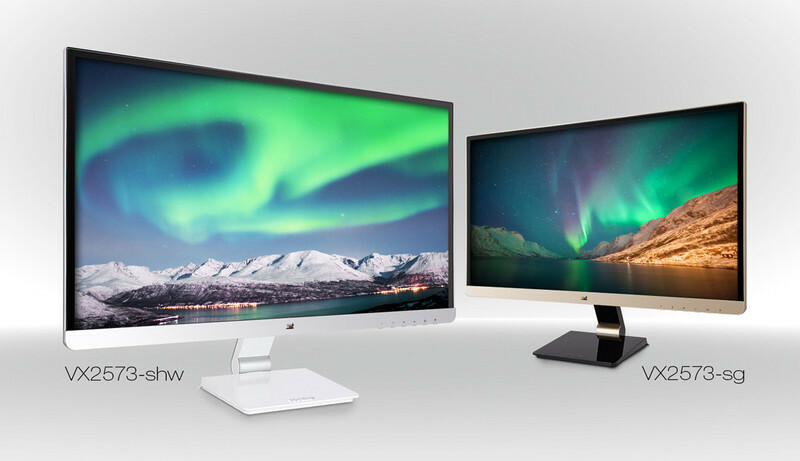 ViewSonic Corp., a leading global provider of visual solution products, proudly presents the new premium 25" Full HD multimedia monitors, VX2573-sg and VX2573-shw. With a sleek, borderless, glossy-finish, and gold/silver color design, the VX2573 is ideal for homes and commercial environments with a contemporary décor. Additionally, VX2573 is equipped with low EMI emission, Flicker-free, and Blue Light Filter eye-care technologies to achieve a reliable and sincere commitment for the users’ health. The ViewSonic VX2573-sg comes with gold and black color design. In addition to 1920 x 1080 resolution and 80M:1 dynamic contrast ratio, it is equipped with SuperClear® AH-IPS technology, delivering a 178 /178 degree wide viewing angle and stunning image quality with brilliant visual performance. It also comes with Flicker-free and Blue Light Filter eye-care technologies, ViewMode technology for optimal color rendering for different scenarios. With an amazingly convenient My Button hotkey design, it allows users to easily access these functions for further adjustment with one press of the finger. This monitor also features low EMI emissions for a reliable and sincere commitment to our end users’ health. A wall mount design offers additional mount flexibility to set up this stylish, high-performance monitor at any places. The ViewSonic VX2573-shw is a premium 25” Full HD multimedia display with a matte SuperClear AH-IPS panel enclosed in a silver and white, metallic look design. Ideal for the modern home, bedroom or office, the 1920 x 1080 resolution is suitable for viewing high definition media from games consoles, PCs and mobile devices. SuperClear AH-IPS Technology offers great colour reproduction and 178/178 degrees viewing angle resulting in zero off axis colour shift. Flexible connectivity options include VGA for legacy devices and HDMI for current and future devices. ViewSonic Eye Care Technologies include 100% Flicker Free Backlight and an optional Blue Light Filter which can reduce the negative effects of blue light exposure by up to 87%. Finally, VX2573-shw also features Stereo Speakers, ViewMode Optimal Colour Settings and a VESA compatible chassis. Both the VX2573-sg and VX2573-shw meet the MEPS (Minimum Energy Performance Standards) with a 5.5 star, certified by Australia. The MEPS is equivalent to international best practice standards or a more stringent standard developed specifically for Australia or New Zealand. Based on official statistics comparing with other international monitor brands, the VX2573 earns the lowest Comparative Energy Consumption and Active Standby power among all the 25” models selling in Australia, which means that undergoing a rigorous assessment, it does fulfills strict regulation and efficiently decrease energy and electricity consumption greatly, and can save up to 25% on energy cost while reducing greenhouse house. For eye care benefits, the series is equipped with ViewSonic's latest Flicker-free and Blue Light Filter eye-care technologies. Flicker-Free technology completely eliminates screen flickering by integrating DC-modulation LED backlights. The benefit of this technology is to reduce discomfort and eye fatigue, preventing the occurrence of CVS. ViewSonic’s Blue Light Filter technology can be adjusted to different viewing scenarios, lowering the amount of blue light output to a maximum of 87% and protecting viewers from the possible side effects of blue light without compromising the colour performance.